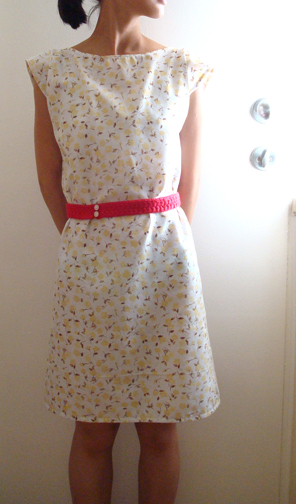 I’ve been saying that I’ll write about my recent experiments in dressmaking, so here it is! :D I’ve been trying to replace some of my really old t‐shirts (dating back to the early 2000’s!) with the flowy blouses that are so trendy right now. I just love the simple structure of those blouses — I love the aesthetic of it and how simple it is to make. 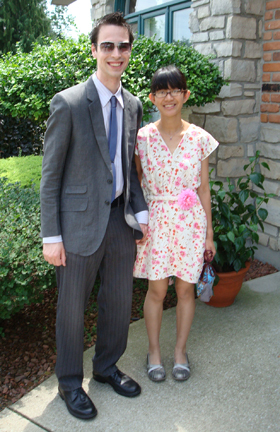 So the dress above is one I made to wear to a wedding. I didn’t have process photos for that one because I just kind of just pieced rectangular pieces of fabric together until it kind of fits. 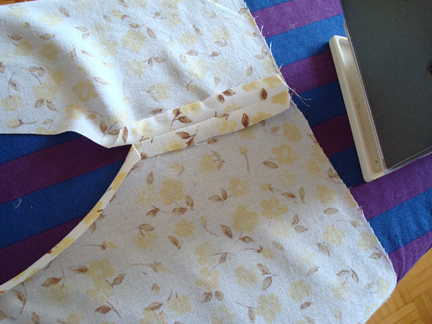 At the end I had to cinch the shoulder seams because I made the neckline too narrow. But it fit in the end. 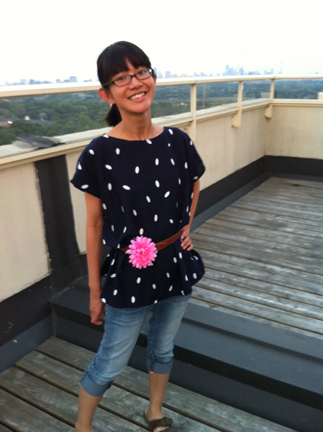 I wore it with the twisty belt and the dollar store fabric flower pin. There’s a closer look of the flora fabric in the twisty belt post. I think I bought the fabric at Walmart when I was a teenager. I also made the skinny tie Mike was wearing! :D Not from scratch though. I just modified an old regular tie, following this tutorial. Here it is with a belt and again, the flower pin. Oooh and I made the red belt to go with it. I thought they looked alright together. I was picturing the dress with a shiny vinyl belt but didn’t want to buy one, so I crocheted one. 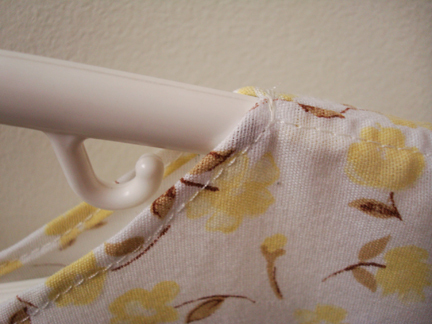 Anyway, with the pillowcase dress I wanted to share how I made the fray‐free seams. I laid in bed awake one night trying to figure out how to deal with the issue of the fray edges. It’s probably something many people know how to do already, but in case you didn’t know and you’re interested, here’s what I did. Here’s the neckline and the shoulder seam. 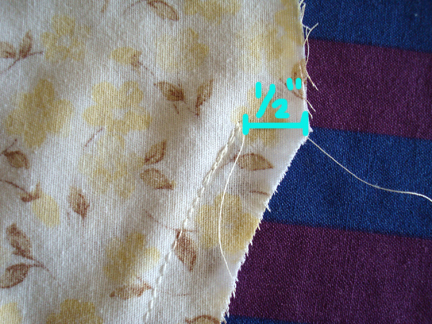 Leaving a 1/2″ seam allowance, with right sides together, I sewed both shoulder seams from the sleeves edge toward the neckline, and end 1/2″ before the neckline. 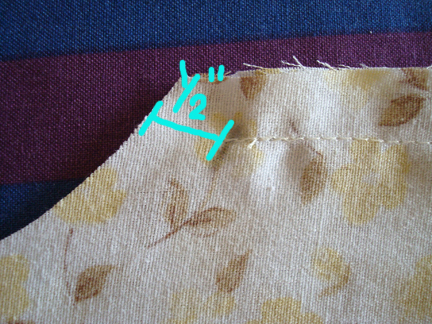 I then tuck the raw edges of the seam allowance under, and pin, all the way across from one sleeve edge to the other. 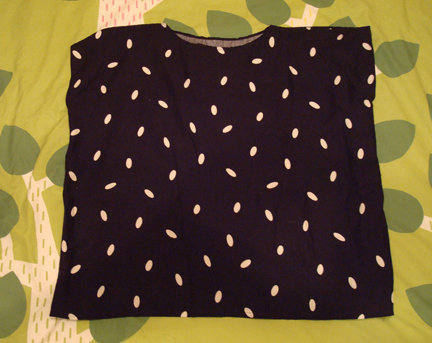 Finally, I sewed a few stitches back and forth in the two spots where the shoulder seams meet the neckline. 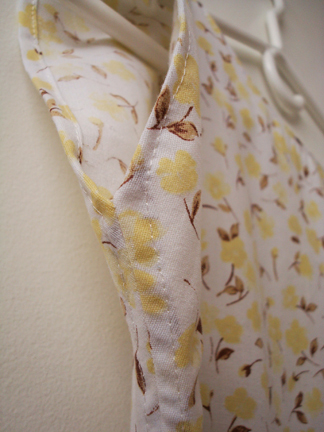 And then the same was done to the side seams and arm holes. First sew the sides together, leaving 1/2″ seam allowance, starting from the bottom hem, stopping at 1/2″ away from where the arm hole begins. 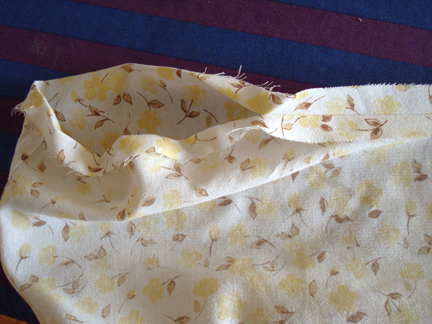 … then tuck the raw edges of the seam allowance back and stitch along. 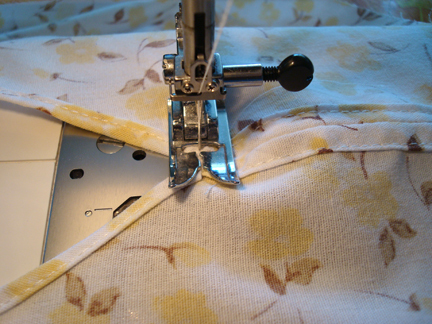 The stitching would go in one big loop starting from the bottom hem, going up the side seam, around the arm hole, and then going back down the side seam and end at the bottom hem. Hope that makes sense! Feel free to drop me a note if you have questions! pretty! Me and my mom where planing to set up the sewing machine so maybe I will make one! I’ve been dealing with the same issues as a newbie, with your explanation, I was able to realize what to do. Thank you! I’m so excited to go home now and start a project! Cute dress…there are a few ways to alter the dress to make easier to put on and take off. 1. 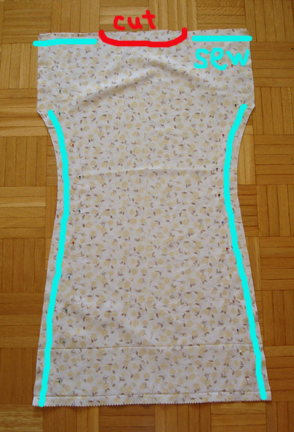 In center back neck, cut a 4 — 6 inch tear drop shaped circle and use bias tape for the facing…then add a button to one top point and a elastic cord, as a button hole on the other top point. 2. 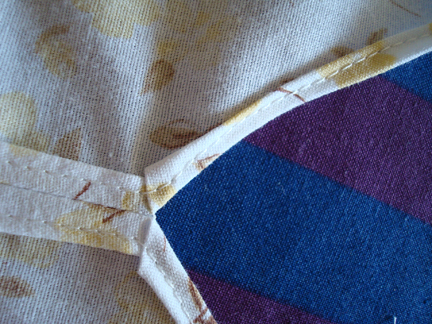 Seam rip to open one shoulder seam, using bias tape as facing on both sides, add 3 — 4 cute buttons to the lower flap and matching elastic cord loops .. As button holes .. To the top flap. 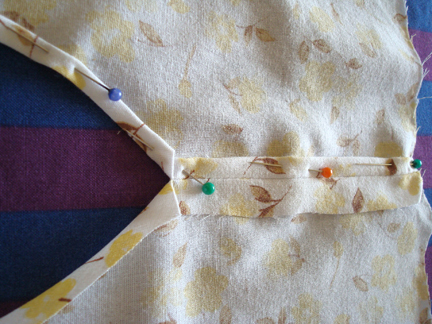 Sew buttons and elastic to come together as if the seam looks closed..with buttons decorating. LOVE the wall of yarns! the elastic cord loops for button holes idea is brilliant! must give it a try one day. the tear drop shaped circle on the back would be especially cute. thanks so much Cyndee!